I really feel like these today …. its cold and raining and I have been on the computer all morning… these are really simple to make as long as you don’t have to run out and get any ingredients. I cook Asian all the time, so have these condiments in my pantry. I also love the gow gee wrappers that the mince is wrapped in and often have them in my fridge. If they start to get close to the “use by date”, I throw them in the freezer, and that way I always have some on hand. Freeze made ahead Pot stickers in an airtight container in the freezer for up to 1 month. Thaw in the refrigerator before cooking. Not a pork fan use chicken mince instead, or try adding a few chopped prawns to the pork mixture. I sometime fry these dumplings. juts heat a frypan with some vegetable oil over high heat and once they have cooled down a little form steaming, toss them in a pan fry on one side. This gives a wonderful crunch, but also leaves a couple of sides that are still silky soft from steaming. 1 Combine mince, garlic, onions, ginger, sauces, sesame oil, and sugar in a bowl. if you have a couple ) steam for 7-8 minutes till cooked through. Repeat with remaining dumplings. 4 To make Dipping Sauce: Combine all ingredients in a small bowl. 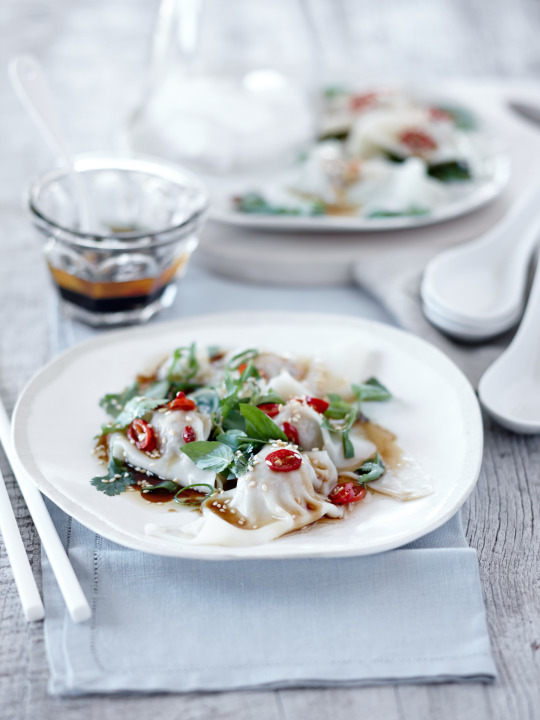 Serve dumplings with dipping sauce, topped with extra shallots, herbs ,chilli and extra sesame seeds. Sizzle tip- I also love to eat these steamed , but fried on one side. Heat 1 Tbsp vegetable oil in a large non stick frypan, over high heat, add dumplings into pan in a circular fashion. Add 1/2 cup water and place lid on saucepan, reduce heat to medium and cook for 7-8 minutes, remove lid and once all the water has evaporated, cook the dumplings for a minute or so more till golden on one side. Serve with dipping sauce.